Bernie Torelli (dearly departed Founder of Nomad Factory and old-time retail partner of DontCrack) introduces, Bus Driver. When we first decided to do the Bus Driver giveaway to thank everyone, we thought we would stop it after a month or 25,000 units whichever came first. We gave away twice that number as of March, and had great success reaching out to the audio community. As we now approach a amazing total of 60,000 units, we say again a huge thank you! You made it great success. We are now selling Bus Driver at the no-brainer price. Please continue your support, we love that you’re enjoying these superb Nomad Factory products. We will smartly invest every single dollar in R&D. Thank you for your support and involvement! 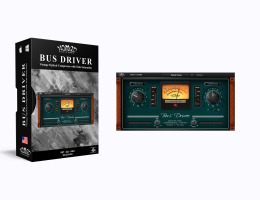 Bus Driver is an optical compressor that provides a wide range of compression effects, reminiscent of the best vintage compressors made in the ‘60s. Compression is one of those studio processes that is all too often taken for granted and not usually used to its full potential. Today’s producers think nothing of inserting compressors on every single channel of their DAW when mixing, but old school engineers had to learn to make the most of only a few units of compression and this made them learn them inside out to use them to their best advantage. Bus Driver is modelled on the classics from the 'golden age' of tube compressors. Also included in Bus Driver is a Tube-Driver Saturation feature. It allows you to add the sound of a vintage tube amplifier giving you the differing electronic characteristics of triode, tetrode, and pentode vacuum tubes. So you can add the vintage warmth of the those models of the classic tubes (e.g. ECC83, 12AX7, etc..) to your tracks or on your mix bus. Nomad Factory designed an Output Stage Soft-Clipping to eliminate digital clipping at any output level and produce a smoother distortion characteristic. This feature is in addition to the Tube-Driver Saturation Modeling included in Bus-Driver. Hopefully you will be using every day and that it will accomplish the goal of saying 'Thank You' for the heart-warming support you showed for Bernie during the time when he really needed it. RAM 2 GB (4 GB recommended). Mac 'PPC' are not supported. AAX Native, AudioUnit, and VST plug-ins. Download the demo and take Bus Driver out for a test drive, and let your creativity burn up the track.